When I was asked if I’d be interested in reviewing the recently released Hardie Grant cookbook for kids Little Kitchen, Around the World by Sabrina Parrini, I got excited! A trip around the world for young kitchen adventurers – perfect for the little girl who is just starting to become interested in a variety of different flavours and cuisines and whose kitchen skills have improved immensely over the last few months. Little Kitchen, Around the World is Sabrina’s second kids cookbook, filled with “delicious international recipes that kids can really make”. There are 36 recipes in fact, that come from all corners of the globe introducing kids to a variety of cuisines and cooking techniques in a new and exciting way – thanks too to the imaginative, fun and sometimes very quirky styling by Deborah Kaloper. Flicking through the book we giggled at the photos of the super hero protecting the scalloped potato dish from villains, we learnt that Japan is made up of four islands and that people in the USA and Mexico celebrate the Day of the Nacho every year on 21st October. I thought that was a great and a unique feature of the book. After all learning is more fun when you’re having a good time! 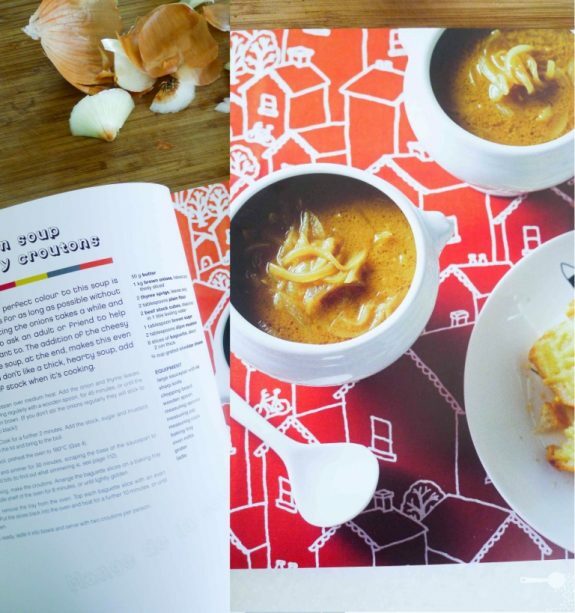 We picked a couple of recipes to try, including one of Daddy’s comfort food favourites – the French onion soup. Weather in Spring, just like during Fall, tends to be temperamental so it’s always good to have a cold-spell dish up the sleeve. We have included our adaptation of the recipe below. Variety of recipes from around the globe teaches about different cuisines, cultures and traditions. Turns cooking into a fun learning activity! Facts about some dishes and countries were presented in a fun way. Introductions to some dishes and method descriptions were a little lengthy for 7-8 year olds to grasp and not get lost in. 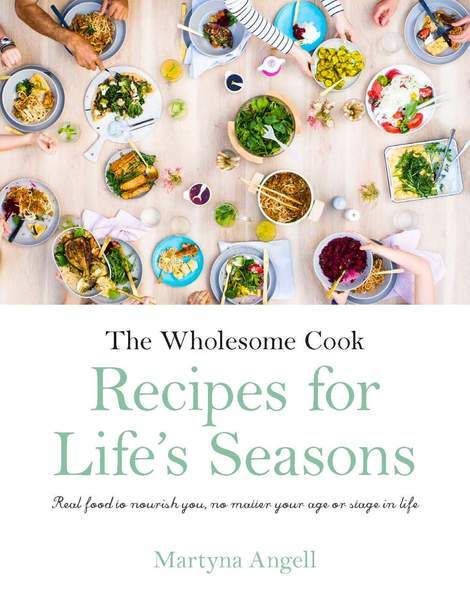 Wholesome Cook received a complimentary copy of Little Kitchen, Around the World from the book’s publishers. Available from all good book retailers or online from SBS shop. RRP$29.95. From Little Kitchen, Around the World by Sabrina Parrini (an SBS book, Hardie Grant 2011). The recipe itself was easy to follow and yielded a rich, sweet soup. We followed the suggestion of asking a grown up (me) to help with the chopping. My own tip: you can blend the leftover soup, freeze it in an ice cube tray and use as gravy! Also, we used a beef-style stock to make this soup vegetarian but still yummy. To make the soup: melt the butter in a large saucepan over medium heat. Add onion and thyme. Stir for a couple of minutes until the onion begins to soften. Cover with a lid and cook, stirring often for about 45 minutes, or until onion is soft and caramel brown in colour. Do not let the onion burn, it will taste bitter. Add the flour and stir well. Cook for a further 2 minutes. Add stock, sugar and mustard and stir to combine. Bring to a boil then lower heat, cover partially and cook for a further 30 minutes. To make the cheesy croutons: preheat an oven grill to medium hot. Place baguette slices on a baking tray. Sprinkle with grated cheddar cheese. Grill until the cheese has melted and starts bubbling. To serve: divide soup between 4 bowls. Serve cheesy croutons on the side or dunked into the soup. Sprinkle with freshly ground black pepper if you like. Thanks for the review of the book. I’ve seen it at the shops and have been wondering whether to get it for my 11 year old niece. Now I think I will. Great recipe and so easy to follow. Thanks! I love onion soup and yours – I mean your daughter’s! – looks like one of the best onion soups I have ever had! My recent buy of Moomins Cookbook also confirms the fact that cookbooks for children can be a great source of foolproof recipes. This is a great review. It’s good to see young people interested in cooking. Healthier, cheaper food at your fingertips. I can’t wait until my little ones are old enough to *really* help in the kitchen. And my husband loves french onion soup, too. Is it a man thing? Oh gosh, I LOVE French Onion soup and haven’t made it in ages. Thanks for re-introducing me to it. Yours looks lovely. I love French Onion soup too, great post! What a great soup and review. Thanks SO much for reviewing my latest cookbook!